Sony Online Entertainment announced today that their upcoming super-hero MMORPG DC Universe Online will be pushed back to an early 2011 release. Developed for PC and PlayStation 3, the game was originally schedule for November 2010. 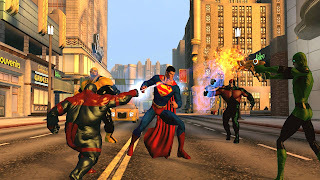 SOE did not give an exact date of when in 2011 the game will be released, however, they did announce in a press release that players who had pre-ordered the game already, as well as those who pre-order before November 15, 2010 would receive a guaranteed spot in currently ongoing beta. Cataclysm, the third expansion set to popular MMORPG World of Warcraft, will be released on December 7th, 2010. Mike Morhaime, CEO and cofounder of Blizzard Entertainment, said in a press release “Cataclysm includes the best content we've ever created for World of Warcraft. It's not just an expansion, but a re-creation of much of the original Azeroth, complete with epic new high-level adventures for current players and a redesigned leveling experience for those just starting out. With the help of our beta testers, we're putting on the final polish, and we look forward to welcoming gamers around the world to enjoy it in just a couple of months.” Cataclysm will be available in stores with a regular edition and a collector’s edition, which includes an in-game pet. The game will also be available via digital download from Blizzard’s own online store.